You want the truth, the hole truth, and nothing but the truth? November 5 is National Doughnut Appreciation Day! Some calendars list it as simply National Doughnut Day, but research shows this floating holiday is typically the first Friday in June, and landed on the 7th this year. What did we celebrate on June 7th? Chocolate ice cream, as a matter of fact. Because we had National Jelly Filled Doughnut Day the very next day! No doubt, we’ve celebrated doughnuts several times this year, most notably on our wedding day. But there’s always room for one more doughnut holiday, right? I’ll always have a soft spot for doughnuts…not just because they’re delicious, but because they were the inspiration for this food challenge in the first place. ‘Twas one of the doughnut holidays (I can’t remember which exactly, but I do think it was fall, if I remember correctly) when I was driving to work and the DJ announced it was National Whatever Doughnut Day. When I arrived at the office, somebody had brought in doughnuts. How cool! I thought. I wonder how many other food holidays exist? I laugh over my naivety now. The answer, my friends, is right here in this blog. MANY. LOTS. HUNDREDS. At least one for every day of the year. Sometimes, two or more. We have celebrated over 300 ourselves to date, with over 50 to go yet. And it all started with doughnuts. 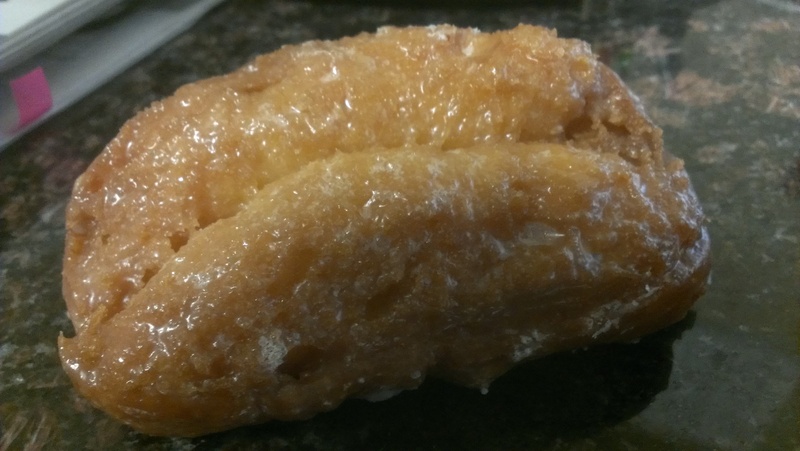 In order to appreciate doughnuts, we stopped by Tonalli’s Donuts Plus, just down the road from our townhouse. They’re one of the better doughnut places in the Portland metro area, and sure enough, did not disappoint. Thanks, Jill! I’m glad to hear you’ve enjoyed this, and have been reading so long. For what it’s worth, the blog will continue next year – we’ll just have different types of food-related challenges and stories, and they won’t happen every day. This has been very satisfying, but a lot of hard work, too! Too bad their is a computer screen between me and that there doughnut! It was SOOOO goo…err, I mean, eww. Nasty. Gross, disgusting buttermilk bar. Blech!